Catholic Health Initiatives (CHI) has a long-standing commitment to violence prevention that was formalized in 2008 as a system-wide campaign - United Against Violence. Working through public policy, community-based initiatives, socially responsible investing and education, CHI addresses violence across a broad continuum. CHI recognizes that this complex issue must be addressed with a multi-faceted approach. Our commitment to preventing violence, along with our inherent call to care for our most vulnerable community members, compels us to address the devastating issue of human trafficking – the practice of modern day slavery. Human trafficking is an affront to basic human rights and dignity, and health care providers are uniquely positioned to identify and respond to victims in the health care setting. The resources on this page accompany CHI’s clinical education modules, supporting health providers with additional information, tools and materials for clinical practice. Addressing Human Trafficking in the Health Care Setting is an educational course developed by CHI, in collaboration with Massachusetts General Hospital Human Trafficking Initiative. This comprehensive course will aid clinicians in human trafficking victim identification and appropriate response. 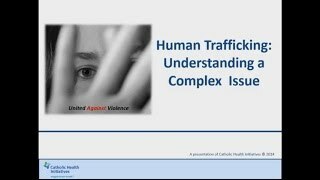 For a general introduction to human trafficking, please see CHI’s video: Human Trafficking: Understanding a Complex Issue. This educational video also comes with an accompanying brochure.